Our physicians are on-site to evaluate and treat any sports-related or over-use injury. Their expertise in the treatment of sports injuries can help ensure a quick return to your active lifestyle. *Most insurances accepted (please call clinic for specific information). Passport Health Plan accepted. 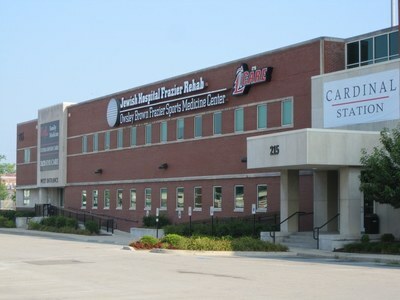 Directions: Our office is located in Cardinal Station, 215 Central Avenue, Louisville, KY 40208. It is just west of Papa John’s Cardinal Stadium. From I-65 N: Exit 133-A Eastern Pkwy. Turn right on Eastern Pkwy, right on Crittenden Drive, right on Central Avenue. Cardinal Station is just past the overpass (and football stadium) on the right. From I-65 S: Exit 135 Crittenden Drive, then right onto Central Avenue. Cardinal Station is just past the overpass (and football stadium) on the right.